Acquisition History: This area was acquired through LCIP and donations between 1990 and 1992. Description: Located on the west shore of the Bellamy River between Dover and Portsmouth, the areas consist of various land types, vegetative associations and wildlife habitats. Prominent natural features include riverside shoreline, tidal creeks, salt and fresh water wetlands, second growth woodlands, old fields, and fields with a more recent history of agriculture. The property has two small ponds with earthen dams. 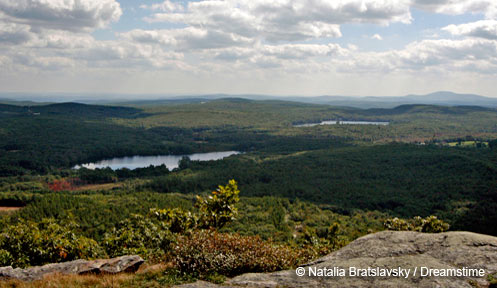 There are trails for hiking, cross-country skiing, and wildlife watching. Hunting and trapping are permitted. Common Wildlife: Deer, pheasant, upland game, bobolinks, meadowlarks and waterfowl are present. This property is a major feeding and resting area for migrating waterfowl and estuarine species such as herons, gulls, osprey and sandpipers. Hunters Please Note: The Bellamy River WMA is home to New England cottontail rabbits, a state listed endangered species and a candidate species for Federal listing. Cottontail rabbit hunting is not allowed at this WMA, or in Dover and many other surrounding towns. Keep all dogs under your control. If your dog flushes a cottontail rabbit, please restrain the dog and move to another section of the WMA. Special Notes: Surrounded by several urban communities, the value of this tract is enhanced as it can serve as a natural refuge for use by its urban neighbors. Varied upland opening management has occurred since the mid 1990s. In the fall of 2000, a commercial timber harvest/habitat improvement project was completed. The project created patch and strip cuts to regenerate oak, provide woody browse, and increase structural habitat diversity. A Wildlife Habitat Improvement Project (WHIP) is underway to re-establish native warm season grasses for grassland bird habitat. Directions: From Route 108 (Durham Road) near Sawyer Mill Apartments in Dover, head south on Back River Rd for approximately 1.6 miles. Turn left on Rabbit Road, right on Old Garrison Road, the left at the sign to the WMA. From Route 4 in Dover, head north on Back River Road for about 1 miles, turn right on Rabbit Road, right on Garrison Road, then left at the sign to the WMA gate.